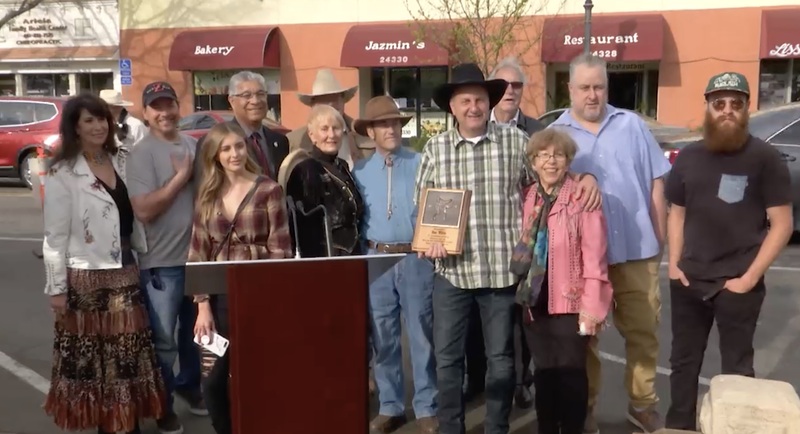 Santa Clarita City Council members honored three Western film legends Thursday night during the annual Walk of Western Stars unveiling in Old Town Newhall. Since 1981, The Walk of Western Stars has honored the legends of Western film, television and radio who have contributed to America’s heritage. Inductees are honored with bronze stars and terrazzo tiles stamped into Main Street in Old Town Newhall. James Drury is best known for his success in playing the title role of the 90-minute weekly Western television series The Virginian. He began his Hollywood acting career began in 1954 when he signed with MGM and appeared in bit parts. He worked in such classic films as Love Me Tender, The Last Wagon, Pollyanna and Ride the High Country, and guest starred in numerous television series like Gunsmoke, Rifleman, Cheyenne, Wagon Train and Death Valley Days before being chosen for the role of The Virginian in 1962. After portraying The Virginian for nine years, he returned to stage theatre across the United States. Mr. Drury has appeared as a special guest in numerous films and television shows throughout the years. Known for his distinctive voice, he has done many documentaries and audio books too. Mr. Drury is close friends with Robert Fuller, who is also being honored with a star in 2019. Robert Fuller began his five decade career on television as an immensely popular character actor, guest-starring in dozens of Western television programs including Buckskin, The Big Valley, The Californians, The Restless Gun, The Adventures of Rin Tin Tin, and The Monroes. Mr. Fuller’s big break came in 1959 when he was cast as Jess Harper on the Western series Laramie, which ran until 1963. Following the success of Laramie, Fuller joined another popular Western series, Wagon Train, as Cooper Smith. It was these two roles that made Mr. Fuller familiar to viewers throughout the 1960s and 1970s. Mr. Fuller is also known for his role of Dr. Kelly Brackett in the medical series Emergency! and his role of Vin in Return of the Seven (a sequel to Magnificent Seven). Prior to his retirement in the 1990s, Robert played supporting roles in more than 20 television shows. Mr. Fuller is close friends with James Drury, who is also being honored with a star in 2019. Growing up in Florida, Dan White was a huge star of the Western genre; so much so that he moved his family to California during the Great Depression to be a part of it. He lived in Hollywood and Newhall for most of his acting career, and filmed several of his movies and television episodes right here in Santa Clarita Valley. Dan was inspired to pursue a career in Western films by local Santa Clarita hero William S. Hart. Mr. White appeared in 345 film and television shows, of that 264 were of the Western genre, beginning in 1936 with Everybody’s Old Man and ending in 1975 with Beyond the Bermuda Triangle. The films that made Dan most famous were his numerous appearances in B-Westerns, typically portraying the antagonist. Some of his most well-known were The Yearling, Distant Drums, Red River, To Kill a Mockingbird, Giant, Duel in the Sun, Four Faces West, Jailhouse Rock and Touch of Evil. Photo Gallery: James Drury (“The Virginian”) Joins Walk of Western Stars, 4-11-2019. Photo Gallery: Robert Fuller (“Laramie”) Joins Walk of Western Stars, 4-11-2019. Photo Gallery: Character Actor Dan White Joins Walk of Western Stars, 4-11-2019.